SpaBoom announced that its clients experienced an explosive boost to online gift certificate sales during the holidays with SpaBoom’s Instant Gift Certificates. SpaBoom announced that its clients experienced an explosive boost to online gift certificate sales during the holidays with SpaBoom’s Instant Gift Certificates. With SpaBoom, spas can sell gift certificates directly to their clients right from their own website. 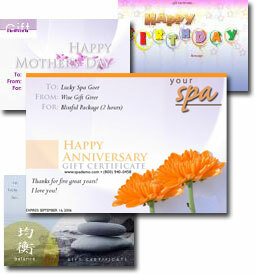 Clients can immediately print or e-mail a gift certificate with a specially chosen design and message. “The two most successful business-building actions I took in 2005 were optimizing my website and partnering with Spa Boom,” said Jill Heijligers-Peloquin, owner Gilbert Bodyworks. “In the short time frame between Thanksgiving and New Years our sales of instant gift certificates amazed us. We are a small business and only have limited receptionist services. The ability for clients to purchase instant gift certificates and to request appointments online has helped us prevent a lot of potential business from slipping through our fingers." Online purchasers appreciate SpaBoom’s instant gratification. They’re able to purchase a meaningful gift for friends or family, and do so in the comfort of their own home anytime, night or day. That aspect of the experience, along with instant delivery of long-distance gifts via the Internet, creates a more peaceful, less stressful shopping environment in general. SpaBoom helps spas take full advantage of their websites by providing instant online gift certificate functionality and management, appointment requests and dynamic website design. Simply put, we’re here to make your website work as hard as you do to build your business and boost your bottom line. To learn more, please visit http://www.spaboom.com.